The heart of the Dark Forest isn't easily accessible. The Black Range provides a formidable obstacle on one side, and the powerful amnesia-inducing effects of the Forgotten Wood make it as challenging to cross. Though the degree of pitch will vary depending on the location, direct sunlight has never been directly observed in the forest. In some places it is perpetual dusk, in others more like a clear night light by the full moon. In other places the dark is utter and complete, admitting no light from a torch even though the flame crackles and burns. There are places where even magical light and arcane vision fail. Whether the darkness is the work of some forgotten wizard, the disastrous fallout of some clash between mighty forces, or some unnatural phenomena, is an ongoing topic of debate and remains unclear. Regardless, all creatures of the night have been known to take refuge here, and build small communes and villas away from the sun-washed cities and plains. Flora and fauna have adapted to the darkness in startling ways. Nightburst - A flower with a bright orange bud, white petals, and purple stripes along the stalk and underside of the petals. If eaten whole, bud, stem, and root, the nightburst modifiers the consumer's vision so that night is like day, and day is like night. Its effects take a minute to activate and last for an hour. The Dark Forest is one of two places that is theorized to house the fabled iron Rod of Peter the Dark. The other is the Forgotten Wood. The Cedars is an unlucky place. Were it not for the fact it is surrounded by areas that were subject to intense arcane experimentation, it would be just another pleasant deciduous forest with pretty leaves. Instead, the color of the leaves, and the time of season mark changes in the flow of magic. Recently found historical documents point to the Cedars as having been planted to prevent the virulent Dark Forest from spreading all over the face of Terrenus. In spring, mana arrives from the Forgotten Wood, and with it memories that were devoured by its power. Travellers who rest in the Cedars during this time have dreams and nightmares lost by others long ago. Most of the time they are mixed and nonsensical, but they are always vivid and distressing. Consuming fruit from the trees that grow during spring can change a person, inflicting recollections that are not their own. In summer, the Hidden Valley warps the Cedars, causing relative distortions in visibility. To certain people, certain people and objects disappear—sometimes forever. It's entirely random, and navigating the Cedars during summer becomes an effort in frustration; it has caused enough unwary travelers to accidentally stumble into unintended consequences. In autumn, it's changed by the Forbidding Hills, where the superstitious claim the spirits of the fallen flock to reenact their battles. Beasts from the Black Range, the Hidden Valley, along with Unnaturals from the Forbidding Valley, and adventurers in the vicinity fight terrible and bloody battles for no apparent reason. Some say it's why the leaves turn red, from the blood and not the change in season. In winter, when the trees are barren and snow covers the ground, the Dark Forest has its turn. The lights dim, they due to a dense fog that forms over the Cedars. Within it, some of the nocturnal creatures of the Dark Forest crawl out to feast on the leftovers or drag them back to their lairs, usually erasing any evidence of what happens. Two years ago, two mercenary groups were chartered for an expedition into the Cedars: Antebellum from Ashville and the Killmasons from Last Chance. In spring, the Killmasons' rations ran out and, too proud to ask the other group, they partook of the Cedars' fruit and had dreams of treachery. When summer came, and members of their group seemed to disappear, they blamed Antebellum and fought to the death. Antebellum won the season, but when autumn arrived, they were further beleaguered by the constant battles. Unable to escape, their camp became a fortress. Since everything was busy fighting everything else, they only had to deal with a few incidents of attempted murder. When winter came, they scavenged corpses of creatures for anything edible, and waited out the winter. During winter, Chrissy, the wife of the leader of Antebellum was caught outside the fortress in the fog. She was dragged into the Dark Forest by a giant spider. Four skilled warriors were sent after her: Shahe, Orzo, Soba and Mafalde. They were not heard from again until recently. After the first year, the fortress became a bastion for the lost, and saw further development by HERB (the Historical and Ecological Research Branch), into the community now known as Clearview. Antebellum is now the Clearview militia, and they help those who have become victims of any of the nearby landscapes. Its population is almost entirely amnesiacs. The second winter saw the return of Chrissy, Shahe, Orzo, Soba and Mafalde, but they were no longer the same, transformed into arachnethropes—spider people. And they refuse to leave. They sit outside Clearview, preaching bizarre gospel, but haven't caused anyone harm yet. Mafalde's husband, Reed, can be found in any temple or tavern in Valucre, searching for cures to Mafalde's condition. Fright Night: Tormo, a large town, has been raided for its gold and resources by Dredge and his allies. Securing their riches and slaughtering the people, Dredge has won the day and has taken liberated prisoners with him while leaving only a burned husk in his wake. Hail to the kings: Dredge's legion arrive at a mountain known to host a goblin village. After using his mercenaries as cannon fodder and bait, Dredge lured the goblins out and engaged them in large-scale combat. After a show of force, magic was used to calm the goblins and subdue their population. A new world to burn: An amnesiac Dredge was summoned to Terrenus for reasons unknown. On arriving he was confronted with a village which proved easy prey. Other evil entities flocked to him and they formed an alliance to crush all who oppose them. Heroes came to stop them and were able to push them back into the shadows but not before the villains wiped out the village. Phantom Light: A lone adventurer fights his way to the heart of the Dark Forest, where in he obtains the fabled Rod of Peter the Dark. Return to the Dark Woods: A little girl is seen wandering into the woods, and then an army of malignant flesh monsters wandering out of it. The removal of the Rod once more lifts some of the darkness, but repeated strain has broken the forest even further, making it an even darker, more chaotic magical zone. The Fall of the Dark Forest: A powerful necromancer, seeking to expand the reach of his kingdom, launches a week-long campaign against the Forest. As a result the forest been possessed by ever more malignant spirits, reanimated corpses, and the foirest's native darkness has grown blacker and more pernicious. A Walk in the Woods: Armin acquires the an artifact, Rod of Peter the Dark. 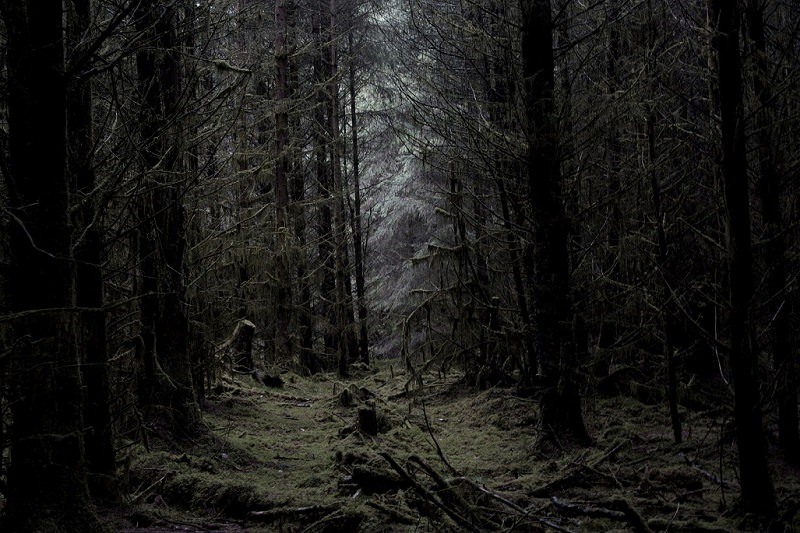 Although the unnatural darkness does not leave the forest, the forest is visibly lightened, indicating that the Rod's presence attributed to its supernatural conditions.